If Johnny jumped off of a bridge, would you? Held smack in the middle of the Fall Blaze, the orange, yellow, red and green colors envelop the deep gorge. Add in 450 BASE Jumpers, perfect weather and one awesome girlfriend and you have the perfect recipe for a man who works way too much. Before you ask, I did not jump this year. The regulations require 100 jumps. I have a total of 0. 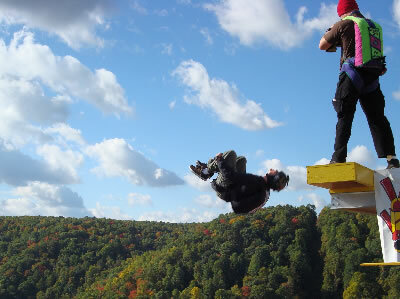 However, jumping off the New River Gorge Bridge is on my short list of things to do before I die. I am going to work on meeting the requirements over the next calendar year. Interestingly enough, more participants were hurt in Pro Football Games this past weekend than BASE Jumpers jumping off of the 876 foot span. This goes to the stringent requirements for jumpers and professional attitudes of the organizers, staff and participants. Of course, a mistake in Football means bruised ribs, bruised ego, or torn ACL. 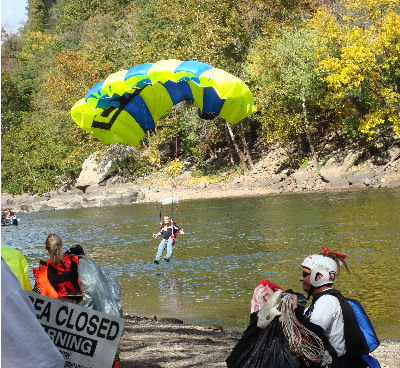 A mistake in BASE Jumping is fatal. There is no reserve chute. That said, it makes me proud to be an American that we have such an event as Bridge Day. 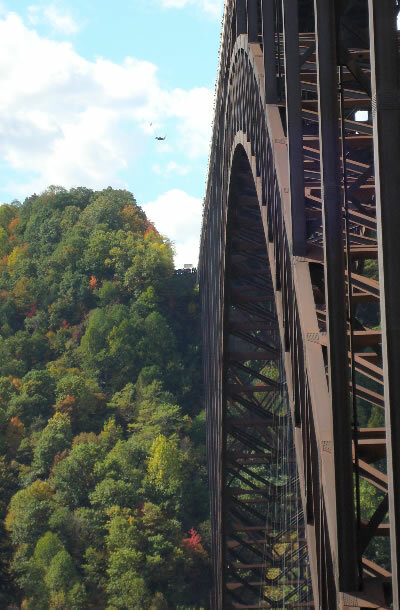 Thank You West Virginia for sharing your bridge with us! Also, a big thank you to Shannon, a super-awesome girlfriend who puts up with me, my hectic work schedule, lets me work on the laptop in the car and generally makes my life a whole lot better. She is also a better photographer than I. Once we post all the pics from this weekend, that will be quite obvious.